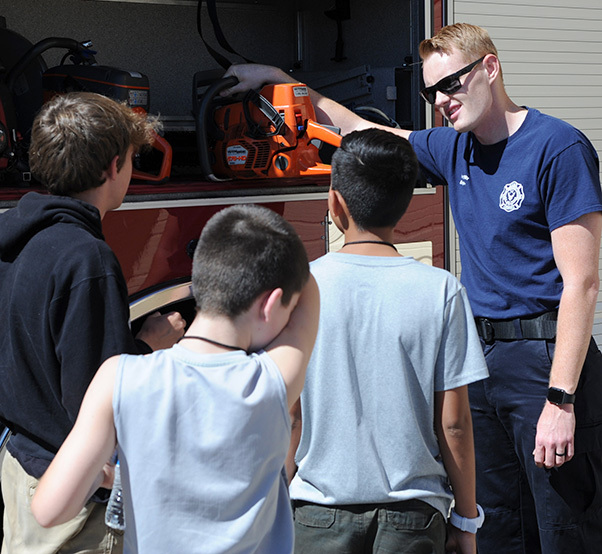 Ryan Witt, 56th Civil Engineer Squadron Fire and Emergency Services engineer, shows equipment on Engine 364 to the children of Childhelp at Luke Air Force Base, Ariz., June 12, 2018. Children spent time touring Fire Station 361’s living quarters, equipment and vehicles. 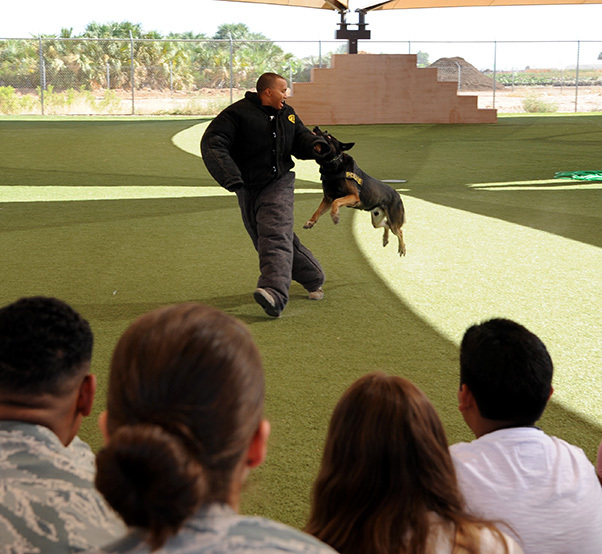 Airmen gathered outside of the 56th Security Forces Military Working Dogs section at Luke Air Force Base, Ariz.
Staff Sgt. 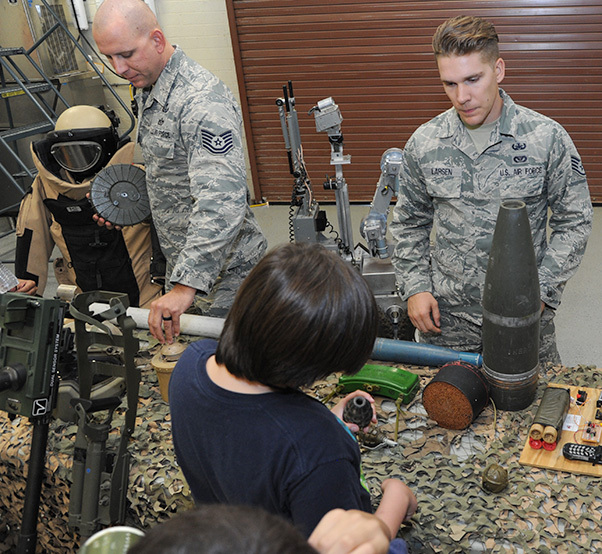 Brandon Larsen, 56th Civil Engineer Squadron Explosive Ordnance Disposal team member, shows different explosive ordnances to children of Childhelp during the “Day of Hope” event at Luke Air Force Base, Ariz., June 12, 2018. Each child paired up with an Airman and spent the day attending various planned events. Staff Sgt. 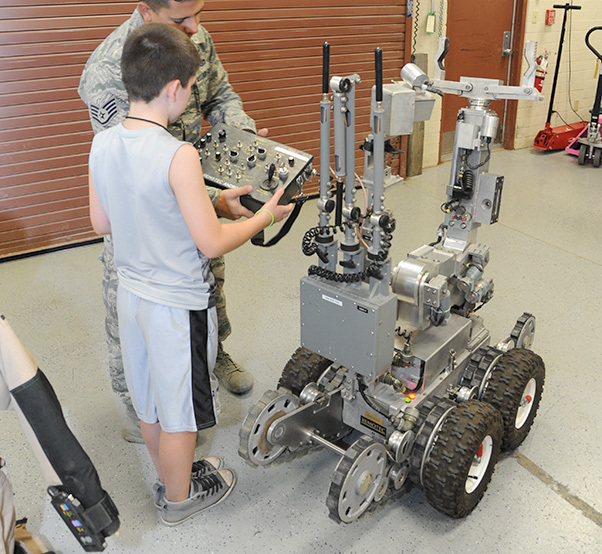 Raymond Johnson, 56th Civil Engineer Squadron Explosive Ordnance Disposal team leader, shows a child how to operate a base response tool at Luke Air Force Base, Ariz., June 12, 2018. 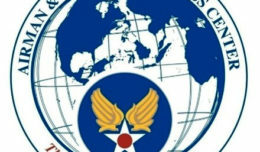 The 56th Security Forces Squadron hopes to make “Day of Hope” an annual event with Childhelp. 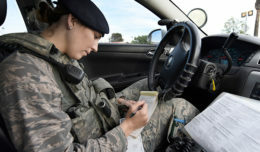 Although Airmen from the 56th SFS have partnered with Childhelp for the past 14 years through an annual Christmas toy and back-to-school supply drives, the “Day of Hope” took the efforts of Thunderbolts from across the wing to happen. Staff Sgt. Jordan Cantrell, 56th Security Forces Squadron military working dog handler acts as a decoy during an exhibition at the 56th SFS Military Working Dog kennels at Luke Air Force Base, Ariz., June 12, 2018. The 56th SFS has partnered with Childhelp for the past 14 years through an annual Christmas toy and back-to-school supply drives. Chief Master Sgt. 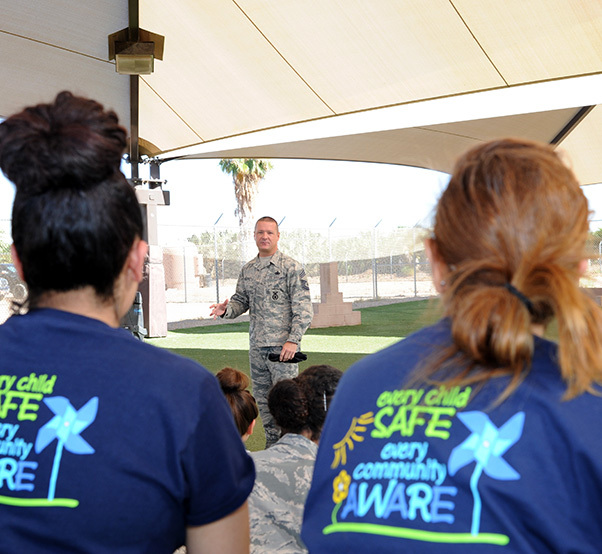 Donnie Bolton, 56th Security Forces Squadron manager, welcomes the children of Childhelp at the 56th SFS Military Working Dog kennels at Luke Air Force Base, Ariz., June 12, 2018. Childhelp is a nonprofit organization dedicated to helping victims of child abuse, neglect and at-risk children.